‘Brinicles’, the focus of the next Roland Emmerich film? Noooooo! It will freeeeeze us all! Just when you thought you knew of everything it was possible to be afraid of, along comes the BBC’s Naturalist department to add something else to the list. A crew filming at Little Razorback Island, near Antarctica’s Ross Archipelago, witnessed this strange phenomenon beneath the ice sheet. Apparently called a ‘Brincile’, it is caused by a sinking stream of brine, which is denser than the rest of the sea water. 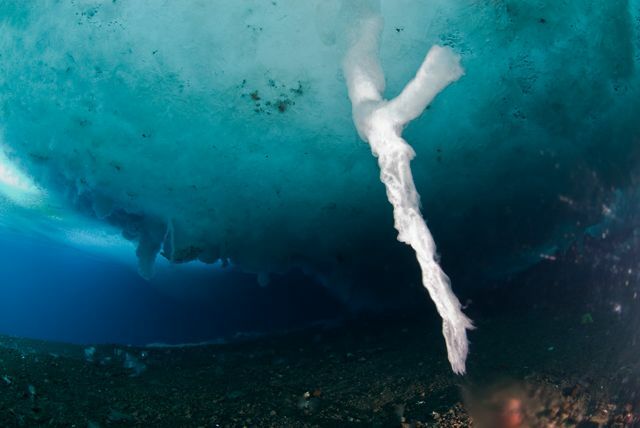 As it sinks, the brine hits the warmer water and freezes, creating this ‘ice tornado finger of death’ thing. As the film crew set up their time-lapse cameras in the icy depths, the Brinicle continued to grow. It took a few hours, but eventually it hit the ocean floor, where it spread outward, ensnaring nearby starfish and other sea life. Interesting stuff, I think you’ll agree. I fear however, that this will only give fuel to Hollywood idiots looking for the next disaster movie concept. I can see it now, ice tornadoes stretching across the ocean, ensnaring ships and plunging out of the Hudson and wrapping around the Empire State Building. 27 Nov	This entry was written by badbabbler and published on November 27, 2011 at 3:58 PM. It’s filed under Awesome, Stuff and tagged antarctica, bbc nature, brrrr!, cold, ice, ice ice baby, icepocalypse. freezing, ocean wonder. Bookmark the permalink. Follow any comments here with the RSS feed for this post.